Hello Vintage: Saved the cutest for last. Saved the cutest for last. Hey all! Wasn't feeling the blogging vibe last week but have had a few finds to share from the last two weeks. The other day I took an unwanted painting from our office to our on site op shop, the volunteer managed to take out some breakables with the back end of it when he did a quick turn. Whoops! Lucky it was just some ugly hand made cherubs, but I did feel sorry for him (he felt terrible). The painting sold while I was there, I am guessing to a volunteer. I rarely find anything at this oppie but I picked up a brand new Tupperware Happy Chopper for $2, still with some cardboard on the blades!! I also bought a couple of Pyrex lids for 25c each, a milk glass plate for $1 (which I blame on Zara from Zaranne Handmade as I loved this post and the pic of the milk glass with the red). I bought the blue and white sheet in the photo recently but not here. The week before my sister and I went down south to visit our cousin last Sunday. We popped into Savers on the way (we were excited that it was open on a Sunday). 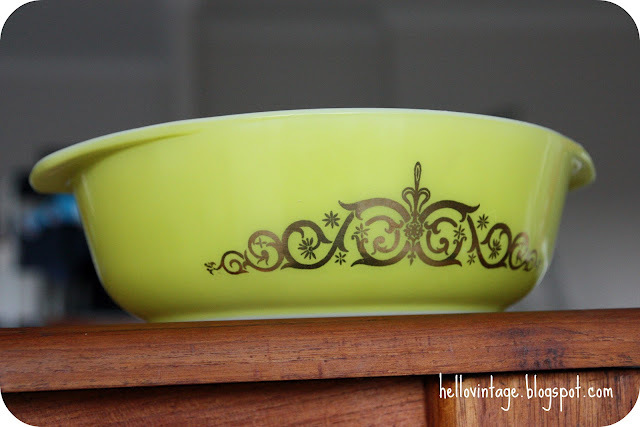 This brilliant green Pyrex is gorgeous don't you think, and the gold is in fantastic condition which you rarely see. Kingsley Ware barrel, I am a sucker for this colour. More Pyrex. $2 for the snowflakes and $3 for the mixing bowl. Oh, actually these were from a local Salvos. I saved the cutest for last! Found this at Red Cross, I nearly didn't walk there because I was pushing Little Miss's patience (this was the third op shop). It did mean I ended up carrying her back to the car and pushing the pram at the same time but it was worth it. Love it! Linking in with Her Library Adventures for Flea Market Finds. I thought you might be interested seeing some of the things I have sold lately (the cat wall hanging is currently selling on eBay). I have been slack again this week but hope to list some things very soon. 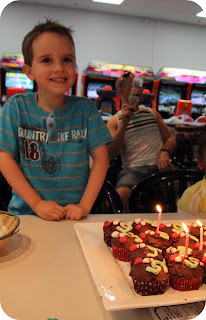 Master M is turning 5 this week. 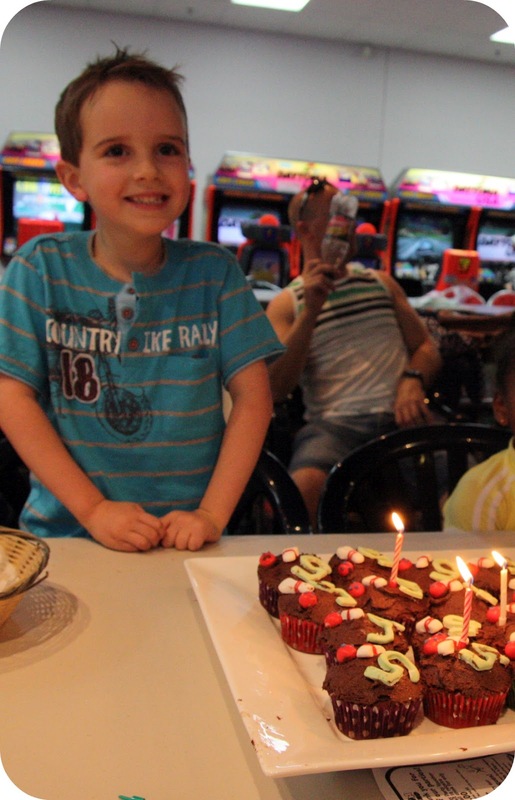 He wanted to go bowling for his birthday so we took his cousins along. I tell you, I am not cut out for childcare (my sister is an early childhood teacher but I didn't get that gene). It was a bit nuts but we all had a good time. The best bit was being able to leave the mess behind! I love to bake but am not an arty person (didn't get that gene either). These cakes are as good as it gets but I think they are kinda cute. I think Master M was happy enough with them. 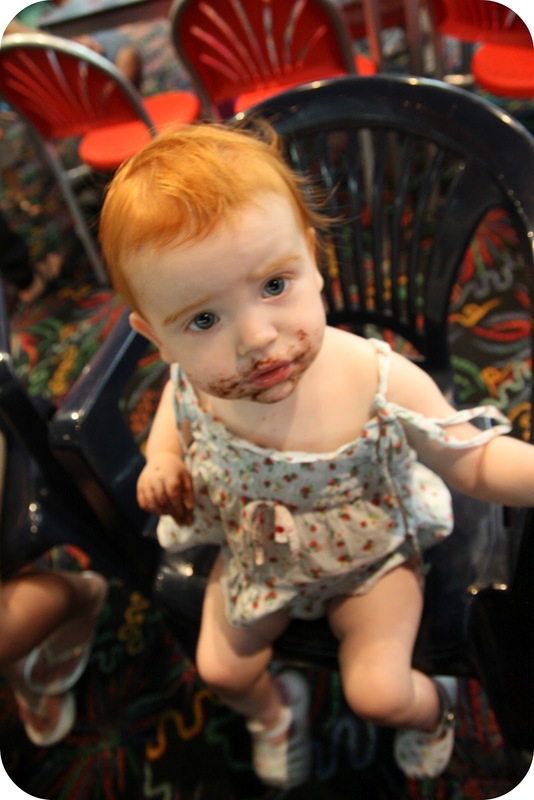 Little Miss too, not that you can tell from the look on her face but what else is on her face (and all over her clothes) gives it away! It's funny, they say that what you eat when you are pregnant can determine what taste in food your children have. I am guessing that's why both of mine have a sweet tooth. Just quickly, is anybody interested in a 'dining sweat and chairs' for $250? There is one selling in an op shop near my work. Hee hee. 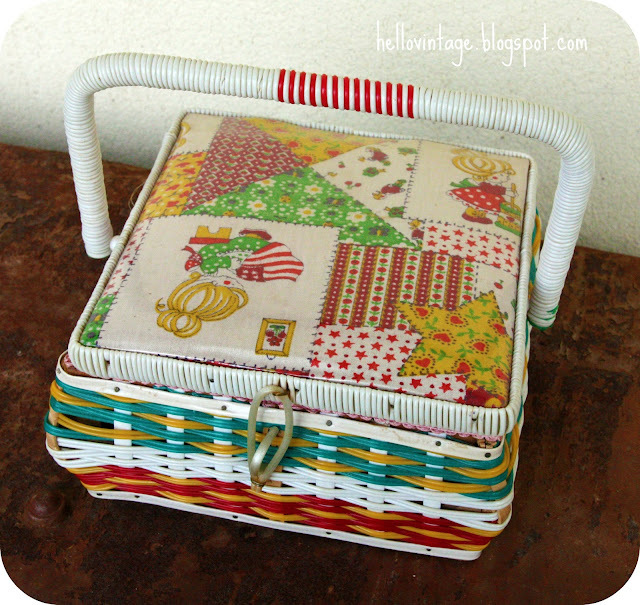 Love the vintage fabric and the sewing basket - great finds. 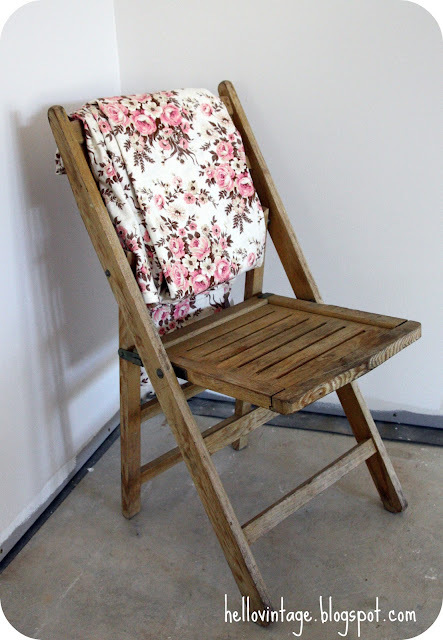 Yeah, great finds, and such a sweet vintage sheet and basket! Wow! You have to be one of the best thrifters around! I love looking at your posts to see what goodies you've picked up! All so good once again. The sewing basket is gorgeous. Have a great week! PS Happy Bday to Master M too! Oh congratulations, you've been converted to milk glass. my job is done :). I also absolutely love love love that basket!!! I'm running a giveaway over at my blog and would love you to enter: Jewellery Pack Giveaway! Gorgeous sewing basket, Pyrex, cup cakes (I think you did a terrific job) and kiddos too. 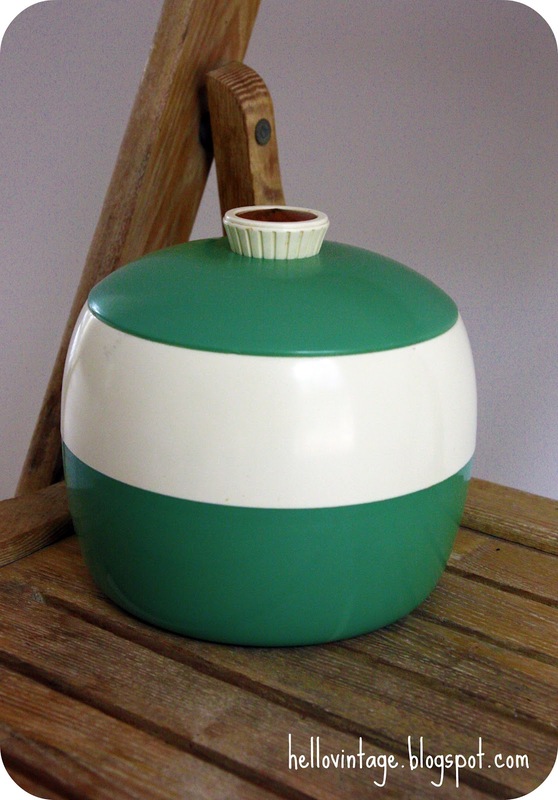 And btw, we had a Kingsley Ware biccie barrel when we were growing up, it was green too, but more of a drab olivey green, not a pretty jadey green like yours Sherry. Wow, that fabric sewing box brought back memories!! Had one just like it but never really used to sew, just used to pack my needles and threads etc. in and out all the time and admire them!! 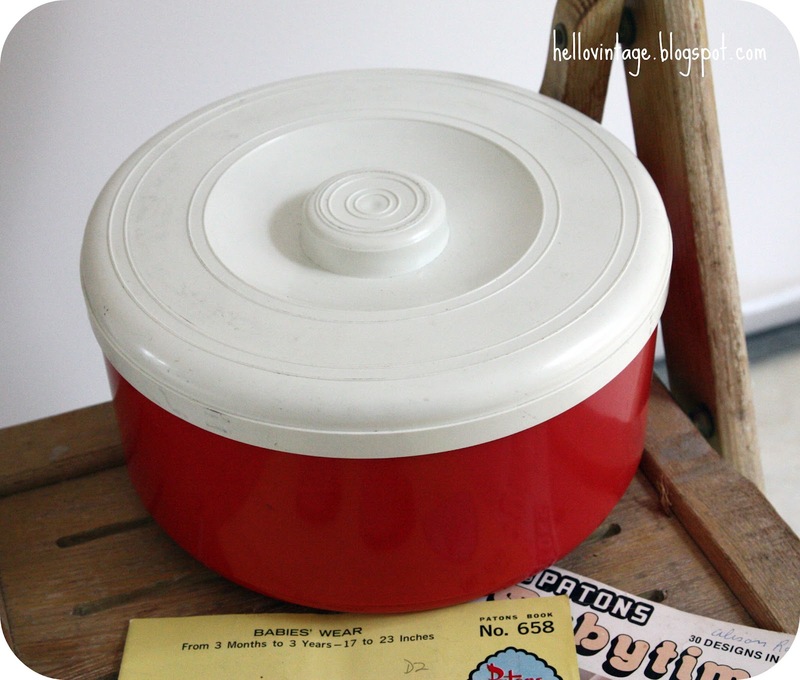 So do you use your pyrex for a lot of cooking or are they just pure joy to look at (I'm not much of a cook!) Hope you have an awesome week! You have a great design eye. Vintage linen is my weakness. That one is fab. Lovely blog. 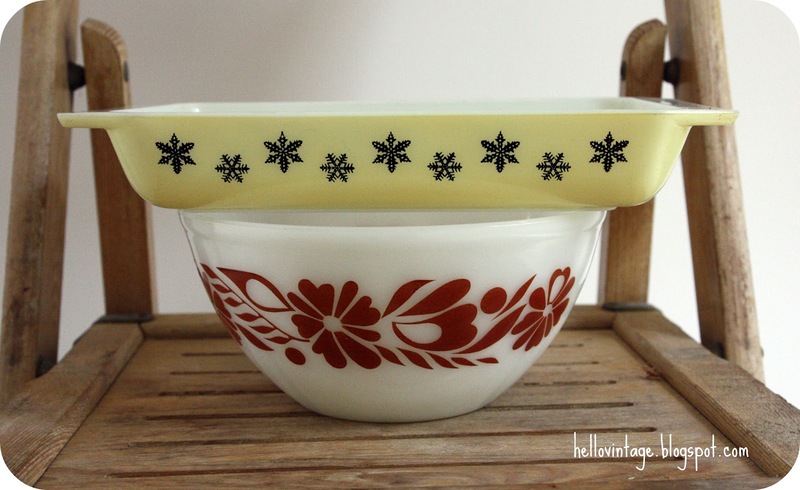 Love the Pyrex - so different from our North American patterns!!! 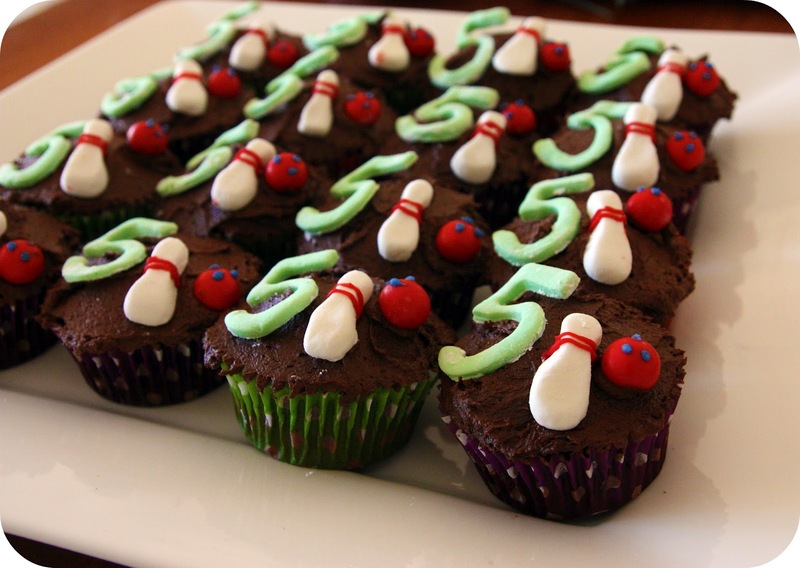 Cakes are too cute, love those kiddie pics,and your fabulous finds. 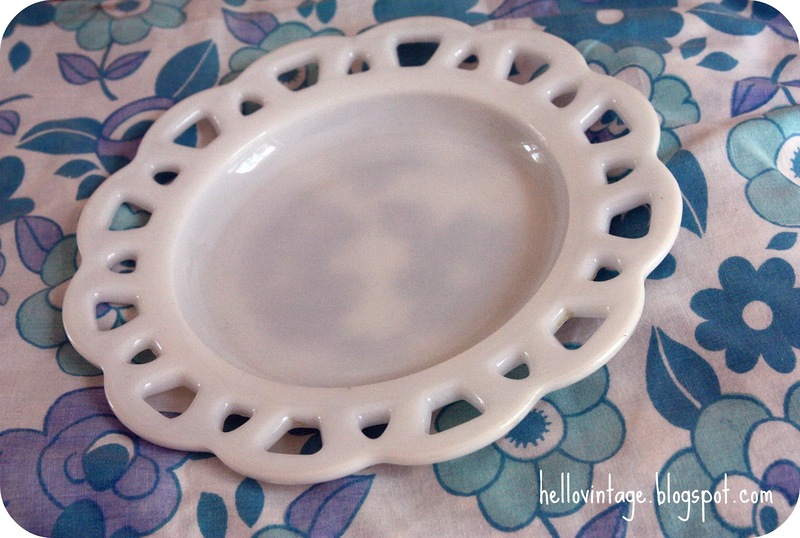 MEGA love the snowflake Pyrex dish! More finds here than I thought I had!